Description: This somewhat prickly shrub is about ½-3' tall, branching occasionally. It is usually erect, but taller plants sometimes sprawl. The prickles on the woody stems are slender and straight, and pairs of prickles often occur on opposite sides of the stems. On new growth, the hairless stems are either green or pinkish red, later turning brown. The alternate compound leaves usually consist of 5-7 leaflets (oddly pinnate); a few short stems may have only 3 leaflets. The central stem of each compound leaf is slightly hairy. Each ovate leaflet is about 2" long and 1" across, with strongly serrated margins. The underside of each leaflet is glabrous or only sparsely pubescent. At the base of each compound leaf are two prominent stipules, each terminating in a single pointed tip. The flowers are usually solitary, occurring on pedicels with glandular hairs; they are about 2–2½" across. The sepals of the flower buds also have glandular hairs. Each flower consists of 5 pink petals (rarely white), 5 green pointed sepals, numerous bright yellow stamens, and a pistil structure at the center of the flower that is flat and wide. There is a typical rose fragrance. The blooming period occurs during early summer and lasts about a month. 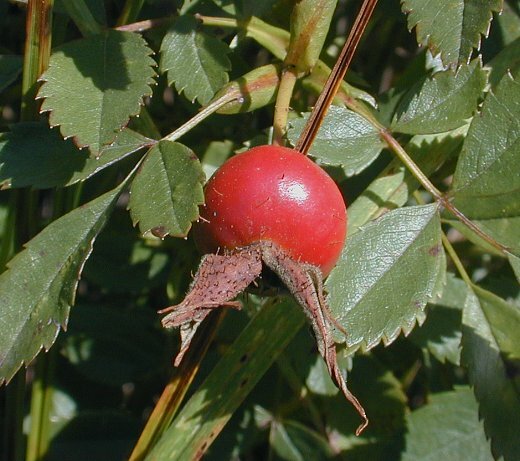 Later, bright red rose hips appear that are often slightly flattened when compared to other wild roses, although not always. The root system consists of a deep central taproot that branches occasionally. From shallow rhizomes, this plant can spread vegetatively, forming small colonies. Cultivation: The preference is full to partial sun, average to dry moisture conditions, and soil that contains loam, clay-loam, or sandy loam. Other kinds of soil are also tolerated. This plant is more resistant to foliar disease than most horticultural roses. It is faster and easier to start plants using cuttings, as seeds are often slow to germinate and develop. Improved germination may result if they are exposed to an acid treatment, simulating passage through an animal's gullet. 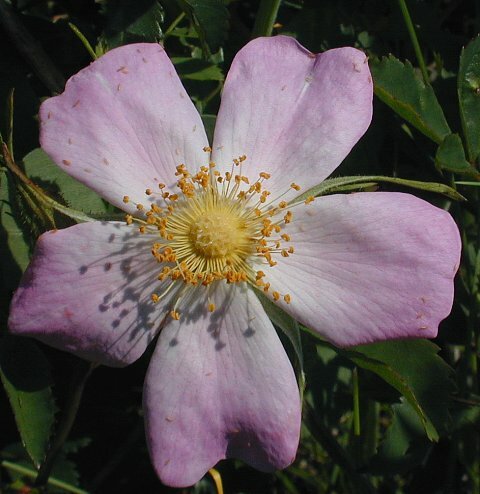 Range & Habitat: The native Pasture Rose occurs throughout Illinois, except for a few southern counties (see Distribution Map). It is quite common in many areas. Habitats include mesic to dry black soil prairies, sand prairies, openings in woodlands, oak savannas, limestone glades, sand dunes near lakes, fence rows, abandoned fields, areas along railroads where prairie remnants remain, and waste areas where birds are likely to occur. This plant has considerable resistance to drought, and recovers readily from occasional wildfires. Faunal Associations: The most important visitors to the flowers are long-tongued bees, such as bumblebees, Anthophorine bees (Anthophora spp. ), and digger bees (e.g., Synhalonia speciosa). green metallic bees, Syrphid flies, and various beetles (e.g., Trichiotinus piger) visit the flowers, but they are less effective at pollination. All of these insect seek pollen, as the flowers provide no nectar. The caterpillars of many species of moths feed on this and other wild roses (see Moth Table). Other kinds of insects also feed on this plant, including Rhynchites bicolor (Rose Weevil; eats pith of woody stems, buds, & rose hips), Macrodactylus subspinosus (Rose Chafer Beetle), Edwardsiana rosae (Rose Leafhopper), Mordella spp. (Tumbling Flower Beetles; eat flowers), and Lepyronia gibbosa (Prairie Spittlebug). Several upland gamebirds and small mammals eat the rosehips, including the Greater Prairie Chicken, Ring-Necked Pheasant, Bobwhite, Cottontail Rabbit, Eastern Striped Skunk, and White-Footed Mouse. These animals help to disperse the seeds of the plant across considerable distances. The leaves, buds, and twigs are browsed by the White-Tailed Deer and Elk (once native to Illinois), notwithstanding the presence of occasional prickles. Photographic Location: Photographs of the flower and compound leaf were taken at the Red Bison Railroad Prairie in Savoy, Illinois, the photograph of the flowering plant was taken at Meadowbrook Park in Urbana, Illinois, while the photograph of the fruit was taken at a railroad prairie in Iroquois County of the same state. 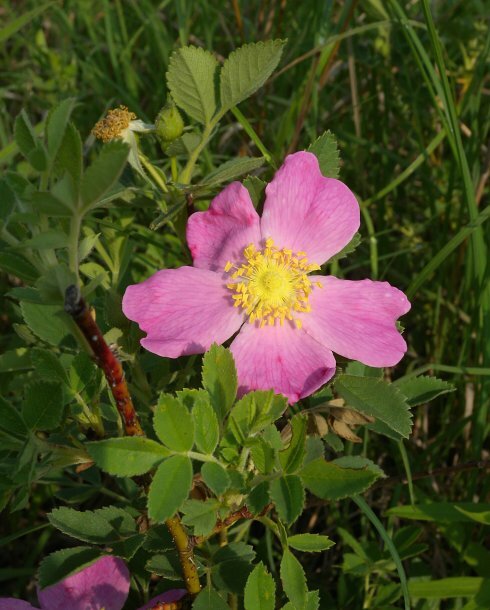 Comments: Among the native wild roses that occur in Illinois, the Pasture Rose ranks high in its capacity to tolerate hot dry weather (rivaled only by the Sunshine Rose, R. arkansana). Distinguishing different species of roses (whether native or exotic) can be difficult. The Pasture Rose has narrow straight spines that are sparsely distributed along its stems, while other species have curved stout spines or very abundant straight spines. 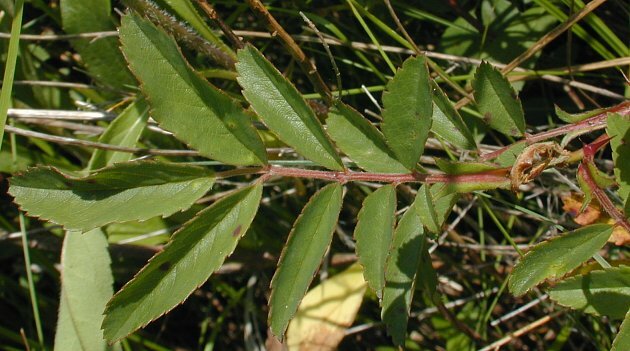 Its stipules lack comb-like hairs (unlike the Multiflora Rose, Rosa multiflora), and the pistil structure is wide and flat, not tall and columnar like many climbing roses. Other features to consider are the number of leaflets per compound leaf, and the presence or absence of glandular hairs on pedicels and sepals.